Jason is a licensed Real Estate Broker with over 17 years of real estate experience and has developed a reputation of service and excellence. While in real estate, Jason has won numerous awards and has been a consistent top producer. His success is a result of a great team, strong company, supportive management, and creative marketing professionals. Having an outstanding, professional team is critical when offering the highest level of personal care that Jason is committed to providing. Jason believes that success starts with building a personable and supportive relationship with his clients. Those relationships are based upon understanding the clients’ needs, market knowledge, and mutual trust and respect. He responds quickly to all inquiries, closely listening to and considering all circumstances & outcomes. Jason has the experience and business acumen necessary to calmly navigate complex situations, communicate effectively with wide-ranging personalities, and negotiate strong positions for his clients. His constant focus is on the clients’ best interest. His knowledge and constant monitoring of real estate market trends provides clients with the detailed information needed to make the best educated decisions. Jason has experience selling all types of real estate: new developments, single-family homes, condominiums, and land development opportunities. Jason maintains a reputation of service by personally keeping in close contact with his sellers by keeping them informed of market conditions, weekly marketing and advertising reports and much more. His unwavering commitment to excellence in all that he does has resulted in clients for life. 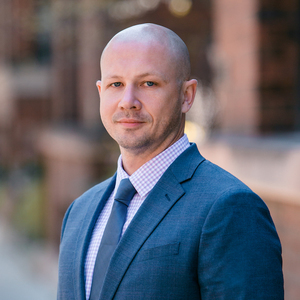 As a lifelong resident of Chicago, Jason can put his insider knowledge to work to find a special property in your neighborhood of choice. He currently resides in the Horner Park neighborhood with his 4 children, and 2 dogs. Jason enjoys training for triathlons and has completed ½ Ironman’s throughout the US. His children are involved in various activities and associations which keeps him busy in the community. He loves discovering new restaurants, neighborhood activities, and seeking out entertainment options throughout the city of Chicago. When we realized we needed to sell our house from 500 miles away, we were very nervous. Jason stayed on top of everything, managing the contractors who were needed for small repairs and keeping us in the loop regularly. Jason is an adroit, no-nonsense negotiator and was supportive of our wishes (and honest with us when it was needed). He’s also very fun to work with. In the end, we sold for a great price and are amazed at how little we had to do to get it. Why select Jason as your real estate agent? He genuinely listens to you, provides a straightforward approach, and works tirelessly on your behalf. As a first time home buyer, Jason helped make the process smooth and understandable for me. His knowledge of Chicago neighborhoods and real estate impressed me and helped me feel comfortable as we searched for places that would meet my needs, and he was always willing to answer my questions and go over everything for me so that there would be no confusion. When it came time to make an offer, Jason's negotiation skills made me glad he was on my side in the buying process. I am truly grateful for all the time, energy, and expertise Jason put into helping me with the home-buying process. I look forward to recommending him to others looking for a home!